I stumbled across Basalt Community Food Garden on the edges of a small Colorado mountain town, cut in half by the Roaring Fork River. I found an oasis within an oasis – a lush food garden nestled between peaks. On the fence surrounding the garden is a sign reading “A Seed Saving Garden + Demonstration Food Forest.” An explanation of the project spills from Steph nearly as soon as I meet up with her on an early Tuesday morning. Her energy is tremendous and captivating, gushing about this project as if it was her own backyard. What I quickly learned about Steph, is her greatest joys have met the hunger of her community. She begins by showing us an aerial map of the garden, an amoebic shaped seed saving garden in the front, and a permaculture food forest in the back. The origins of this project were not here, but at the local library. June of 2014 Steph initiated a “Seed Saving Library.” Same as a library book, you snag packets of seeds -- I grabbed beet and mint. The thought is that you then harvest and return the seeds that your plants produce. By recycling seeds that are grown locally, it’s possible to cultivate strains of seeds that thrive in Colorado’s dry, cold, alkaline soil. Steph hosts free seed-saving workshops monthly, to educate around seed harvesting. Steph’s vision is potent and is gaining traction despite initial community push back. Rooted in a few shelves of seeds, her vision is now a full-scale garden, run by herself, volunteers, and inmates from the Rifle Corrections Facility. As I walk around the garden, she can’t help but douse us in information about each plant. Steph was educated as an herbalist, her head now swimming with facts and uses for every bud and leaf. In the seed garden she points out chamomile, radishes, carrots, potatoes, plantains, tomatoes, yarrow. She stops at yarrow, a hardy flat-topped plant of tiny daisy like buds. “Yarrow is a blood coagulator, used by Achilles to stop his soldiers’ bleeding on the battle field..” Then at the holly hocks, “Holly hocks, alcea rosa, are used as an emollient.” The plantains, “Plantain leaves are the ultimate band-aid.” Steph makes the many of her plants accessible, and easy to imagine incorporating in your own life. For example, a local homeless man meanders in when he has headaches to chomp on medicinal flowers. Local teens are learning to use plants to make lip balm and eye shadow. Her history spills out a bit as I get the grand tour. Steph was put through the often-grim Western health system, taking the gamut of drugs and medicines and then years later realizing the impact they had on her body, and that she missed out on a wealth of other available options. She thus wants to remove boundaries preventing people from taking control of their own health. In her programs for smaller children, they take an oath at the start of class: “We are in charge of our own health.” A sweet and powerful promise, but so often impossibly difficult. Steph has carefully thought through the boundaries to self-sufficient health care. Her seed garden makes herbal and nutritional health options sustainable. With her education programs, she makes the relationship between humans and plants desirable and easy. Her permaculture food forest uses ¼ of the water used on the plot of land before the garden was planted. She has made it so this small garden requires little money and little maintenance. It’s brilliant, she’s brilliant. 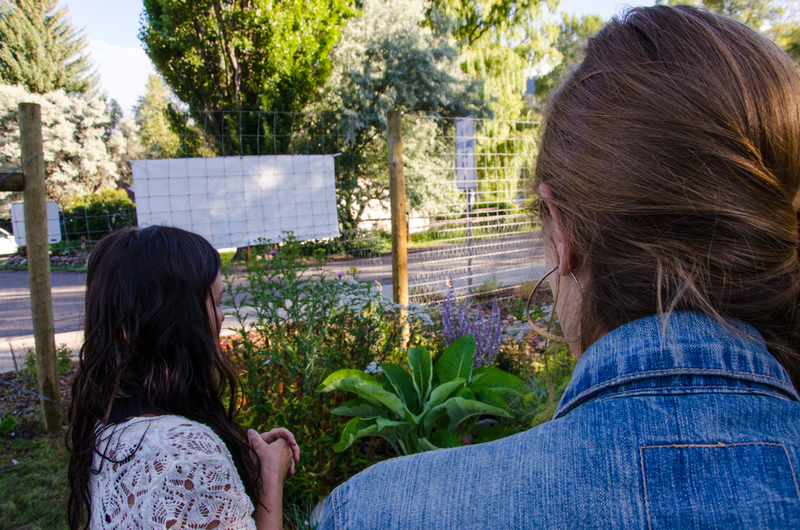 I'll keep our Loam crew updated with what Steph and the Basalt Community Food Garden are up to – seed harvesting parties, cosmetic making workshops, her permaculture radio show. Look forward to some top notch How-Tos with another of her many projects, Dynamic Roots. She fills me with hope and thrill for what bright, passionate energy can do for a community.